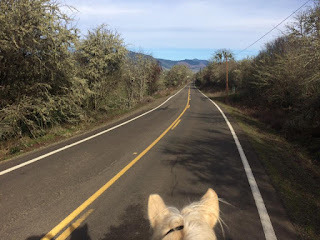 The Centauride: Until next time, Oregon! My second of 48 states has been crossed.... I'm now in Washington - State #3! 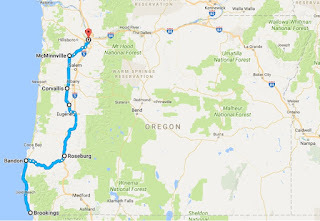 But I'll be back in eastern Oregon in a few months as I head towards state #4 and beyond. 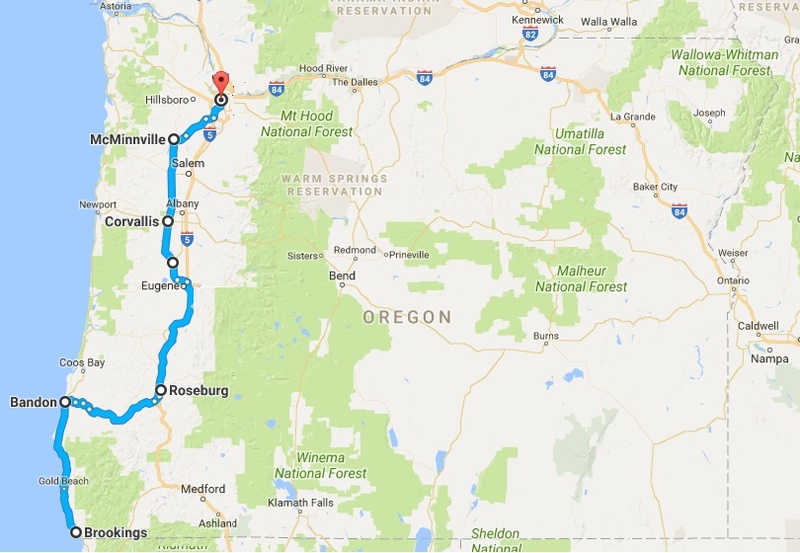 For this first jaunt through Oregon, we entered the state in Brookings and headed north to Portland, a total of about 465 miles. Oregon has been a beautiful state. 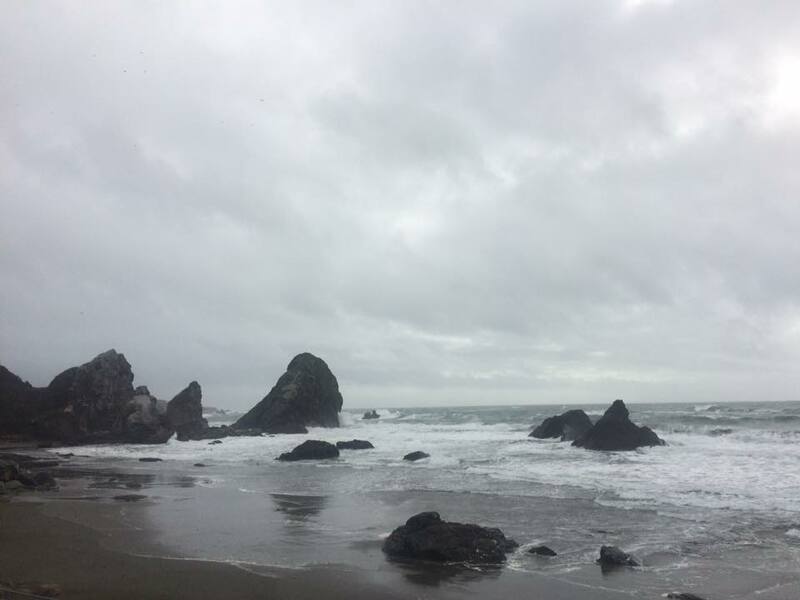 You've probably heard of what a scenic place the south coast is, with its rocky vistas and nice beaches. The coastal mountains, too, are breathtaking with their rushing rivers and tall pines. 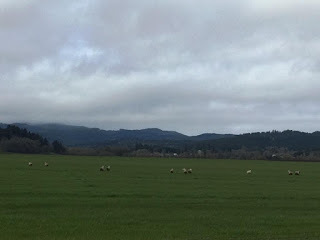 The Willamette Valley is lovely with its green fields and vineyards. And in the last but certainly not least part of our ride through the state, we did our part to "keep Portland weird." As much as I enjoy moss-covered trees and babbling brooks, these only exist thanks to the amazing amount of rain this region gets. While this winter has been wetter than average, rain is so typical here that the locals refer to dry moments as "sun breaks." Most days we rode in some kind of wet weather: fog to drizzle, hail to downpour, with an occasional snowflake for variety. But there was always a friendly host with a warm, dry place waiting for us at the end of each day, which makes the wet going easier to bear. Actually, most of the time I enjoyed the experience of being out in this raw, wild, passionate nature! We rode into Oregon on highway 101, with a break in the rain and views of the coastline. The southern and central Oregon coastline is beautiful and rugged. And wet. My first fan art! 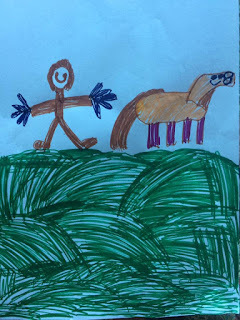 Portrait of me and Apollo by Cleo, age 6. A typical view from the saddle as we rode north along the coast. 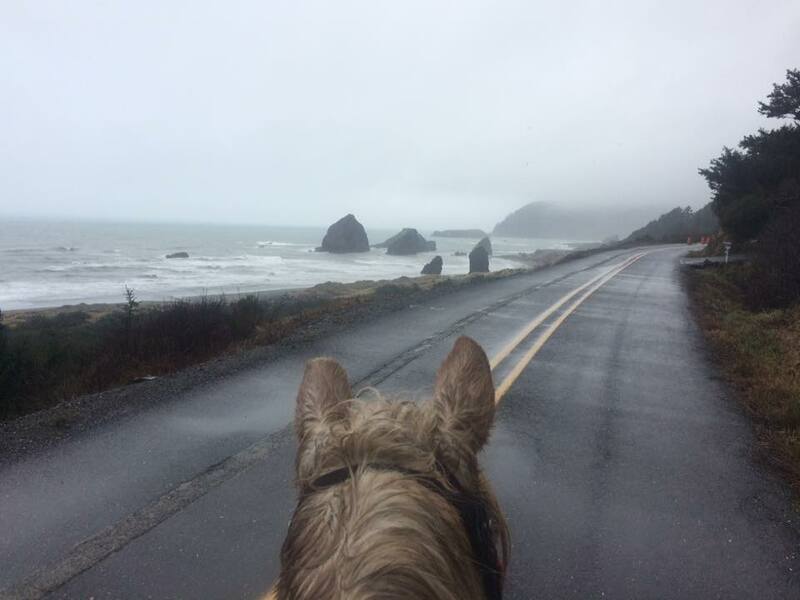 Beautiful views, wet horse. 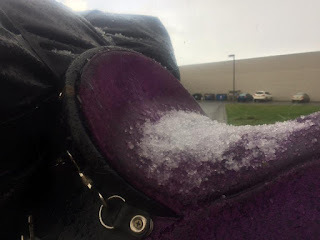 Of the many exciting forms of weather - a huge hailstorm hit while we were in Corvallis. Almost a half inch accumulation, as seen here on my saddle. Some of the best roads for horseback riding were in the mountains near Roseburg. 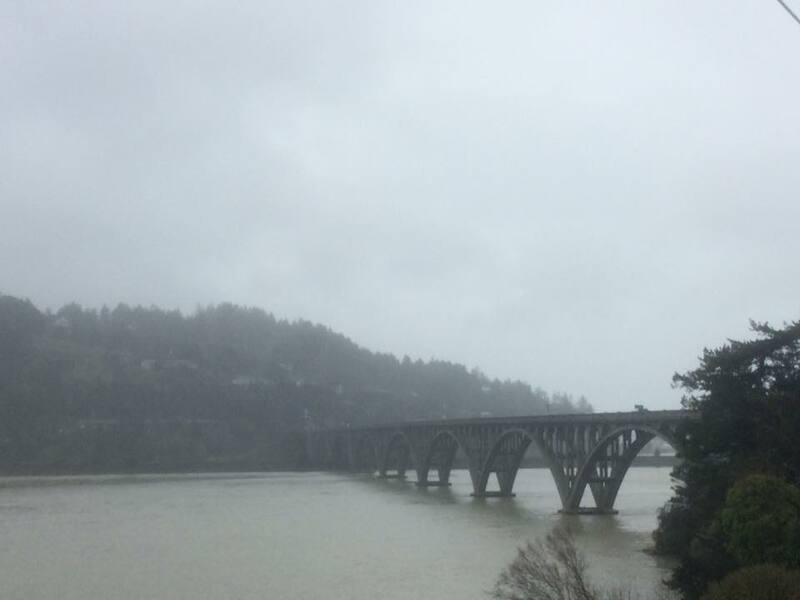 Oregon has lots and lots of rivers. And lots and lots of bridges. This is the Rogue River, which Apollo and I crossed using this the 101 freeway bridge. 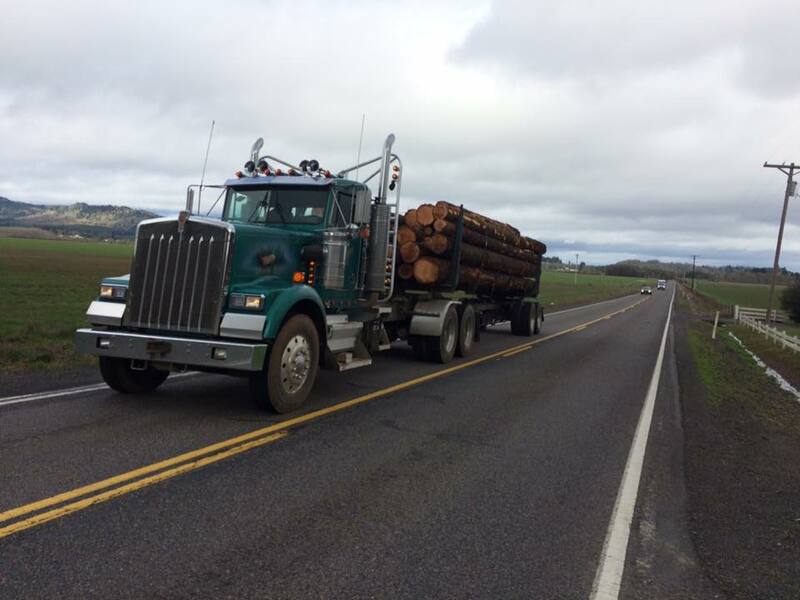 Another (literally) big road challenge in Oregon - logging trucks. 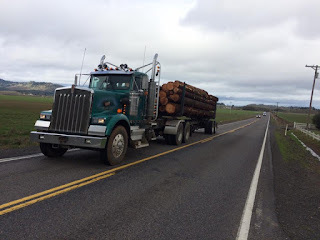 Sometimes with little to no shoulder for us to move over for them. 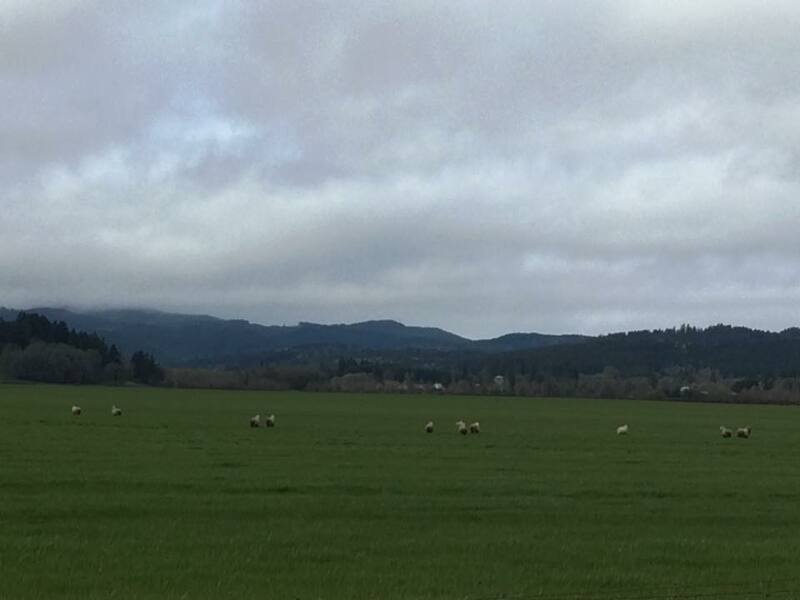 The Willamette Valley is chock full of pastoral scenes such as this. Fluffy sheep and fluffy rain clouds to match. 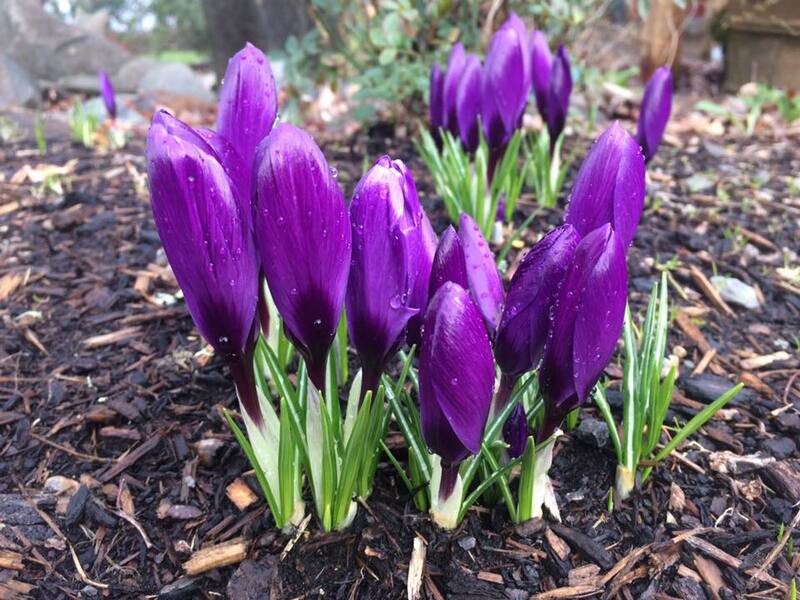 Spring has arrived to the Pacific Northwest, and I had a front row seat to the changing of the seasons, as winter rain gave way to spring rain. 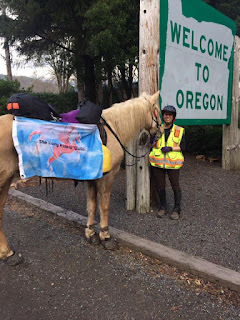 As we made our way to the northern edge of Oregon, we hit our 1000 mile mark (and Apollo and I are now officially a long rider team!) 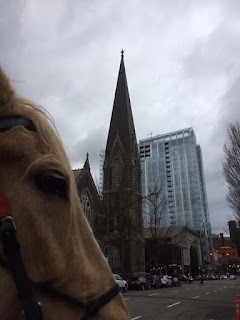 when we rode through downtown Portland (our first metropolis). I'm glad you enjoyed our lovely state and the hospitality of my sweet and generous friend Carla. 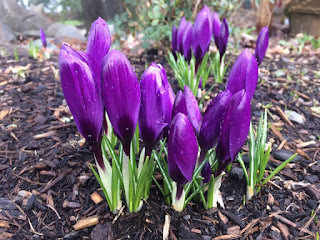 It has been unusually cold and rainy this year! Peace and safety on your journey forward. Good luck on your epic journey with your friend. 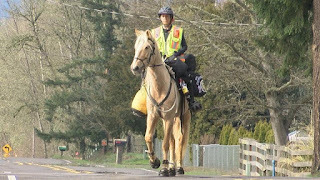 May you both be safe and remember Apollo counts on you to keep him safe, this is your mission and passion our animal friends get taken along on our rides. He's helping you achieve Your goal. Wishing you both sunshine, safety and success. If it weren't for Apollo, this would be simply a long walk (not a long ride)! He's always my number one consideration for all decisions, and a true partner in this adventure. And he's loving it too! 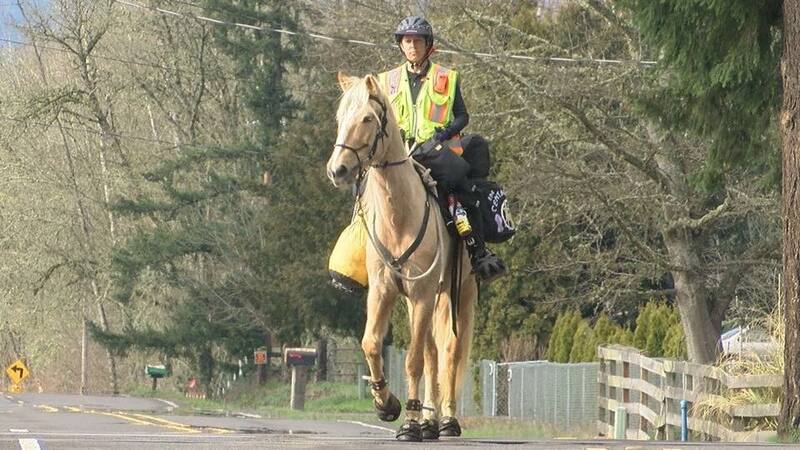 It was delightful to meet you for tea when you stayed in McMinnville, and at least one friend saw you and Apollo passing through town the next day!! It has been super wet, today was lovely here! Blessings and peace as you continue your journey. I'm in awe of the scope of your adventure! I can't imagine in these days riding the roads - but can see that it would be necessary to accomplish your goals. Looking forward to following your journey & will hope to meet you in Iowa! Hello, sorry I missed you when you were in Pendleton. Have you heard of the longriders guild? I am friends with a lady from Montana. Her name is Bernice Ende. She long rides too. Endeofthetrail.com is her blog. You can also find her on facebook. You might look her up. She is headed to Eastern Washington now, from north west Montana. She has been longriding for many years. She finished a 2 1/2 year coast to coast to coast ride last year. I'm sure you would enjoy meeting her. I am familiar with Bernice Ende though I've not yet had the opportunity to meet her. Maybe our paths will cross some day! I've received lots of help from the Long Riders Guild, and am actually officially carrying their flag on my ride!